Wartime America needed all the laughs it could get -- and that's why every Tuesday night found millions heading on down to Wistful Vista for a half hour of fun with Fibber McGee & Molly. The Old Timer claims he's wanted by the FBI! An old document points to a fortune inside an old sofa! 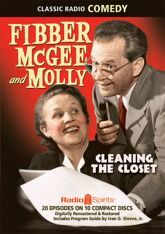 And Molly insists that Fibber clean out his famous closet! This collection also includes the debut of Doc Gamble, as well as a rare performance from the mythical Myrt (the telephone operator). Join Jim and Marian Jordan, along with Arthur Q. Bryan, Gale Gordon, Shirley Mitchell, Isabel Randolph, Ransom Sherman, Bill Thompson, and Harlow Wilcox, for twenty hilarious episodes!